Welcome back! In Part I of the IvyAchievement Counselors’ Guide to Indian College Applicants, I discussed why Indian families send their kids abroad. Here, in Part II, I summarize the main considerations and concerns parents and students have when choosing schools in the United States and Canada. For international students in the United States, the cost of college (tuition, fees, housing and meal plans) runs from about $40,000 to over $75,000 per year without financial aid. State schools are generally in the $50,000-$60,000 range and rarely offer financial aid. Canadian schools can cost a similar amount. Additional costs such as travel, books, and school supplies can bring that total higher. Because college is so expensive, Indian parents are usually concerned with two things: (1) return on investment (employability and salary after graduation) and (2) the availability of financial aid. Parents don’t often realize that there are over 200 colleges in the United States that give financial aid to international students, some quite generously. Some schools offer “need-based” aid, some offer “merit-based” scholarships, and some offer both. I advise well-off Indian clients who can easily afford to send their kids to college to seek merit scholarships anyway, because that money could be used for other purposes! Colleges in the United States that provide the most financial aid to international students. (Click to enlarge.) IvyAchievement has assembled international student financial aid data and admissions statistics on over 200 colleges. Consistent with India’s focus on education, Indian parents are concerned that their children actually learn something in college. Some parents are more focused on their children being qualified for high-paying jobs, while others seek a liberal arts education for their children that is hard to obtain in India. (As I discussed last time, India’s liberal arts schools do not attract the top thinkers and teachers.) Kids tend to value more flexibility, though most are very focused on employability. I often have to explain that reputation does not equal quality. Drexel University and the University of Pennsylvania (a member of the Ivy League) are situated together in a section of Philadelphia known as University City. In the latest US News & World Report ranking, Penn placed in the top 10 while Drexel was 96th. It baffles Indian parents and students (and many others) that the quality of teaching is as good at Drexel as it is at Penn. I have to explain that the advantages of attending an Ivy League school don’t stem from classroom instruction, the way the advantages of attending an IIT might, but rather from other factors, including campus resources, research opportunities, and a global alumni network. Many parents are concerned about prestige and name recognition. There are both good and bad reasons to apply to prestigious institutions. In some parts of the world, a name with cachet can open up doors that a less-recognized name cannot. This may even be the case if traveling to a different part of the United States or Canada from where a particular school is located. If the goal is employment in the United States, I have to explain that a degree from Rutgers or SUNY Binghamton can land a job on Wall Street, and a degree from San Jose State or Santa Clara University can make a Silicon Valley job a reality. Often, expectations are unrealistic. I once helped a student from India with an SAT score in the low 1200s (out of 1600) and a GPA of under 3.0 (out of 4) including a D on his report card. His high school’s policy was to send out only 10 transcripts, so we had to choose his schools carefully. His parents wanted him to apply to Harvard, Stanford, and Carnegie Mellon University, three of the most competitive schools in the United States. His parents were wonderful people, but they simply didn’t understand that even the most talented admissions consultant—or even a professor who might be able to pull strings at a university—would not be able to help such a student gain admission to schools of this selectivity. Other than prestige, their main concerns were that (1) their son be able to get a job after graduation and (2) they were considering a permanent move to California. I convinced this student’s parents to let him apply to the California State University system. They weren’t thrilled with the idea, but now their son has offers from multiple Cal State schools in both northern and southern California. 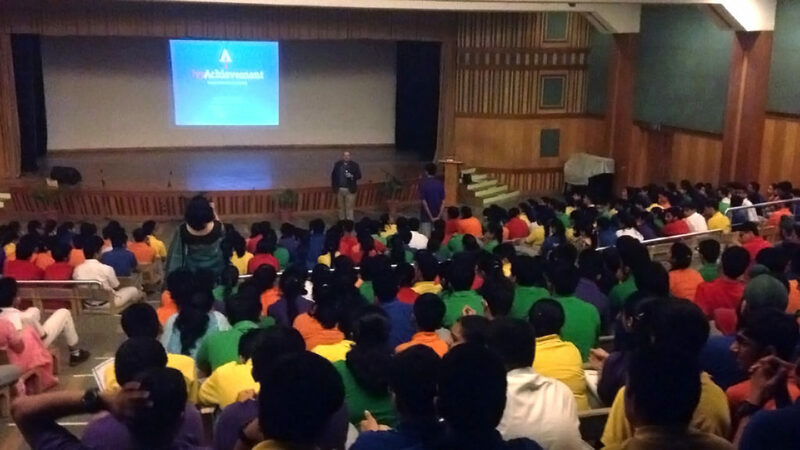 IvyAchievement founder and CEO Ben Stern addresses students at Delhi Public School Vasant Kunj. Parents and students alike are concerned about the political climate in the United States. Last July, in front of an audience of several hundred students at a school in Delhi, a young woman asked me about what I thought would happen if Donald Trump were to win November’s election. “Donald Trump will not be President of the United States,” I declared, to great applause. Of course, like almost everyone else across the American political spectrum, I was wrong. (I did go on to explain that there’s no reason to believe Trump’s policies would not be welcoming of Indian people or businesses.) There are Indians who support President Trump, but among students and parents I’ve interacted with, there’s an almost universal apprehension about certain policies and the cultural atmosphere. Recent racially motivated violence against Indians has not helped. This type of violence is not new (a few Sikhs were targeted after the September 11, 2001 attacks because some Americans associated turbans with terrorism), but I agree with those who say that xenophobic rhetoric tends to normalize such behavior. The political climate has also made parents and students apprehensive about employment opportunities in the United States after graduation. 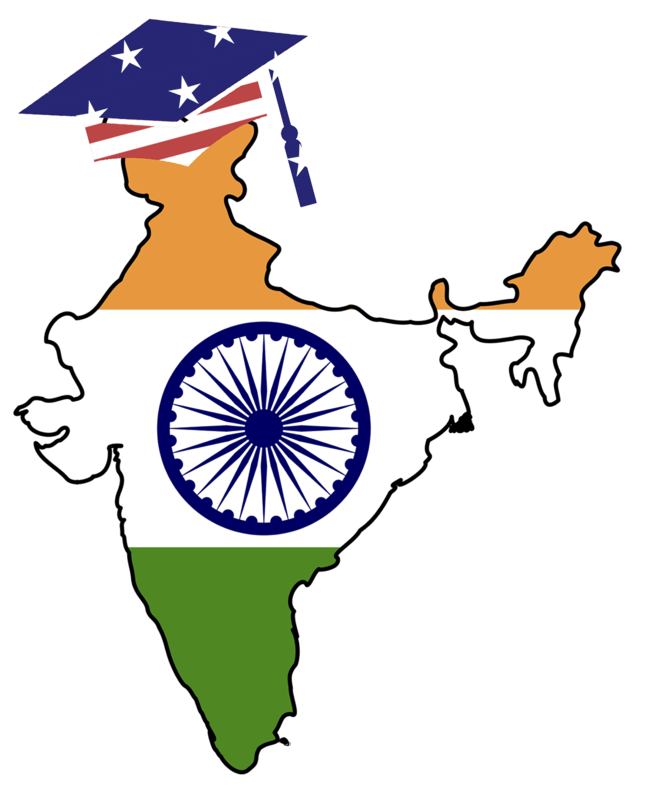 I write regularly about the legal issues, so I won’t delve into them here, but I actually think any visa reforms will benefit Indian high schoolers who want to come to the United States to study at reputable colleges and seek high-skilled jobs. Still, the unpredictability of politics in general and the current administration in particular weighs heavily on the college decision, as it should. For many kids—not just from India—college is their first time in a culturally heterogeneous environment. Indian families tend to be conservative, so at first I expected parents to be concerned about the liberal social environment most college campuses (especially elite ones) offer. Religious Americans I’ve worked with, including Evangelical Christians and Orthodox Jews, have voiced these concerns. Surprisingly, I’ve never had a question about this from Indian parents, either in the presence of kids or privately. Even kids don’t ask about it much. I sometimes recommend a few movies for kids to get acquainted with American college culture, and I try to include at least one wholesome selection (such as Rudy or Good Will Hunting) among the raunchier classics. I also try to help my clients transition to college life however I can. Neither Indian parents nor students seem to care about geography at first; just getting into a prestigious and/or “good” school is enough. I try to educate parents and students about the climatological and cultural differences among regions in the United States. Moreover, popular college guides divide colleges into “urban,” “suburban,” and “rural,” but there are of course many more factors than just that. 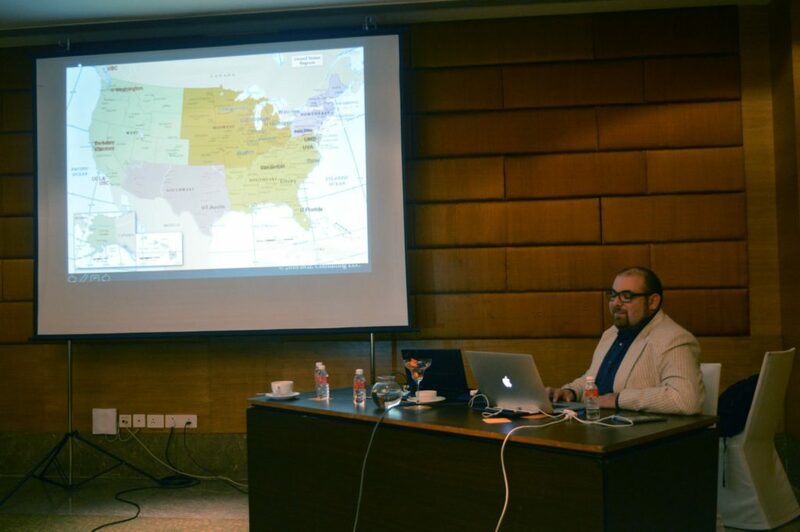 It’s often difficult to convey that such things matter; a section on North American geography and weather was the least popular part of my summer presentation on college admissions and selection, and I was advised to cut it. I now deal with geography and campus culture when counseling families who have already signed up for my company’s services. Indians also rarely consider accessibility for travel to and from India as a factor. Between India and North America, there are non-stop flights only to and from New York, Chicago, San Francisco, Toronto, and Vancouver. (The San Francisco and Vancouver flights were introduced only recently.) Having taken flights between India and the United States both with stops and without, I can confidently say there is a big difference in terms of both travel time and the ease of time-zone adjustment. Families who want to reunite several times during the school year (which I recommend if possible) should keep this in mind. In Part III, I will discuss the Indian high school experience, including academics, extracurricular activities, and tutoring programs outside of school.